I've not downloaded many skins of late, been more of a forum resident these days, but I purchased Don5318's Brass and Fluids WBs today and wasn't able to leave comments... tried twice but no go. I realise that ad blockers and other privacy apps can interfere with the process. However, I have them all disabled for Wincustomize to hopefully avoid those issues. No such luck, unfortunately, so maybe somebody working in the engine room could take a look to see why and maybe resolve the issue/make it easier to comment on skins. 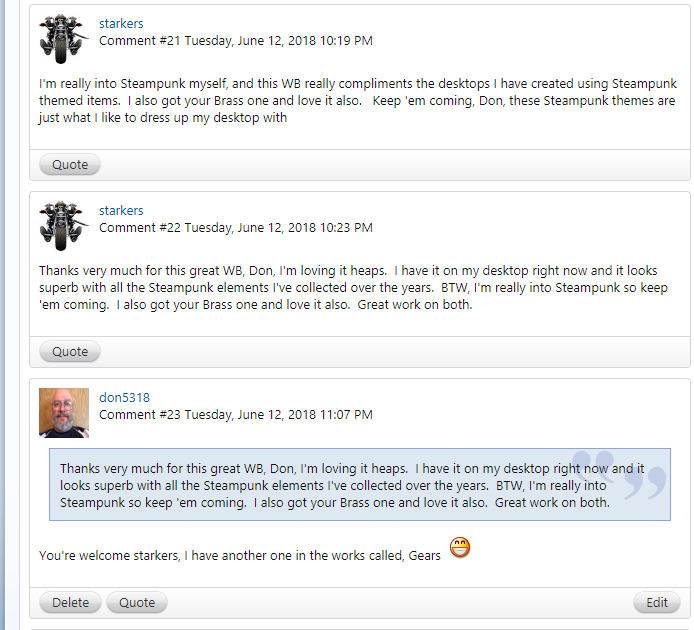 Anyhow, seeing as I couldn't do in the skin comments, just a quick thank you to Don for two great WBs. I'm really into Steampunk and they both go so well with the Steampunk elements I have collected over the years. Great stuff. I just test it and it worked for me. Yeah, I've had this problem before, where commenting on skins wasn't possible... even with all my Firefox addons disabled on WC. I found that disabling them wasn't enough and uninstalling them was the only way I could make comments. However, I really don't wan't to do that as I don't want to get advertising, trackers or popups, etc. Thing is, there was a time earlier this year when I could comment on skins with my addons disabled for WC but still installed. Now nothing has changed to my knowledge, so I'm wondering what has happened to cause it now. This is more than likely something on your browser. Otherwise commenting is working fine on the site. If you can narrow it down to what extension or add-on it is, we might take a look. Hey starkers, your comments on Fluids (if that's what you are referring to) did show up, there was two of them, and I responded to your comments. I disabled all the addons for Wincustomize and there was no difference. It's like last time, when I had to completely uninstall the ad blockers, popup blockers and anti trackers. Once I'd done that I could comment again. Thing is, I don't want to run an unprotected browser and get a whole raft of unwanted, unwelcome stuff, so I really don't want to have to do that again. What I might do instead is use standard IE just to comment on skins, and FF with the security addons for everything else. 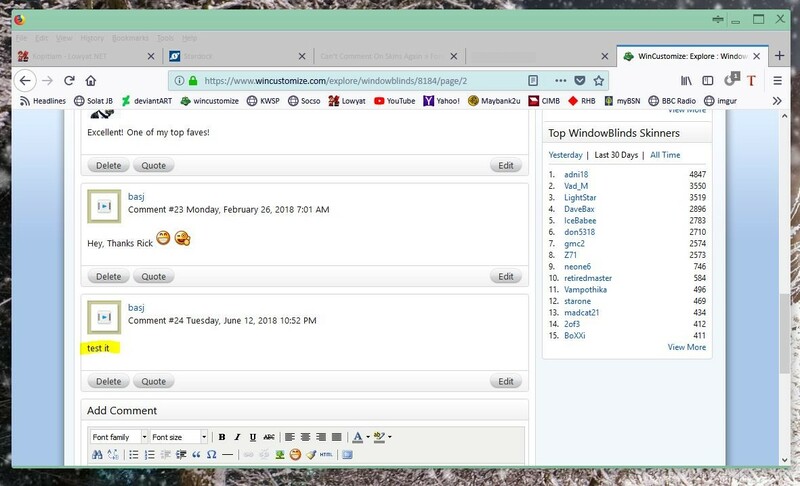 Can you just exclude or whitelist the "http://forums.wincustomize.com" whatsoever addons you prefer ?? Well that's peculiar! When I tried the first time the page went back to the top, and when I scrolled back down to the bottom there was no comment from me. That's when I disabled the FF addons and tried again. Same thing, the page returned to the top and there was still no comment when I scrolled to the bottom. That's when I thought "oh well" and stopped trying.... and now there's two comments from me? Weird, to say the least. @ Don5318. Well I went back to Fluids to see, and weird, weird, weird. The last two entries I see are the ones I saw before trying to comment: the one from Po and your reply to him. I see nothing from me nor your reply. Like what is going on? I went back again and there was still no comments from me... talk about weird. As you can see, the second comment is similar to the first but not the same.... being that I couldn't quite remember what I had said in the 3 or so minutes previous. Hmm, ya get that in the twilight years.